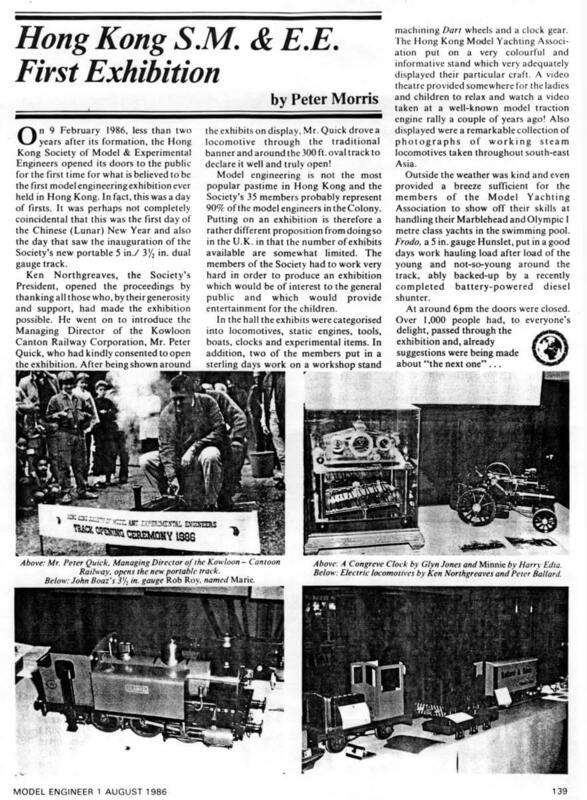 IDJ has sent this article about the HKSMEE’s first model engineering exhibition which took place in February 1986. The exhibition was formally opened, but in rather jolly way, by Mr Peter Quick, the then Managing Director of the Kowloon Canton Railway Corporation, who drove a model locomotive through a banner and around the 300ft oval track. The article also says that though not the most popular pastime in Hong Kong the Society’s 35 members probably represent 90% of the model engineers in the Colony. Model Engineer UK Model Engineer Magazine was first published in the UK to support the hobby of model engineering in 1898 by Percival Marshall, who was to remain its editor for over 50 years. Issue 4528 was published on 19th February 2016.